Stephen F. Austin State University graduate students and faculty from the Department of Geology visited Magnet Cove before presenting at the 2018 South-Central section meeting of the Geological Society of America in Little Rock, Arkansas. From left: Lillian O'Shay, graduate student from Cushing; Dr. Kevin Stafford, associate professor; Joseph Watkins, graduate student from Nacogdoches; Corbin Cannon, geologist with the Arkansas Geological Survey; Colby Reece, graduate student from Killeen; and Annie Robison, graduate student from Livingston. NACOGDOCHES, Texas - The Stephen F. Austin State University Department of Geology sent eighteen graduate students and faculty members to participate in the 2018 South-Central section meeting of the Geological Society of America, held in Little Rock, Arkansas. Twelve students and four faculty members presented research on field areas spanning Texas and Arkansas. Graduate students Lillian O'Shay of Cushing and Joseph Watkins of Nacogdoches gave talks on the characterization of gypsic soil in West Texas and on mercury transport in the Big Cypress Bayou and Caddo Lake watersheds. Graduate students also presented their research in poster sessions, including Heather Dailey of Houston; Kaleb Henry of Waxahachie; Jacob Meinerts of Springtown; Martin Messmer of Savanna, Illinois; Danielle Minteer of Spring; Colby Reece of Killeen; Jessica Shields of Richwood; Bernard Smith of Normangee; Richard Urwin of Montgomery; and Austin Wilkerson of Granbury. The department swept the poster session on karst development and hydrogeology with faculty and students from the department presenting eight of the nine posters. Dr. Mindy Faulkner, assistant professor; Dr. LaRell Nielson, professor; Dr. Kevin Stafford, associate professor; and Dr. Liane Stevens, assistant professor, presented the results of their research. 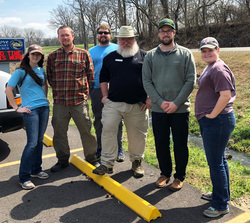 Students and faculty also participated in field trips to Magnet Cove led by staff from the Arkansas Geological Survey in conjunction with the meeting. "Participating in scientific meetings is part of the training our graduate students receive in effective scientific communication," Stevens said. "Preparing a research presentation is a great way to crystallize the details and significance of your work in your own mind, and giving and receiving feedback from other geoscientists is a critical part of the scientific process. Meetings are also a fun way to meet new colleagues, learn about cutting-edge research and enjoy our science."